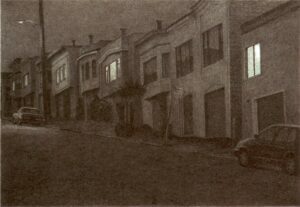 A native and lifelong resident of the Bay Area, Robert Bechtle focuses on the things he knows best, such as family, cars, houses, and neighborhoods. 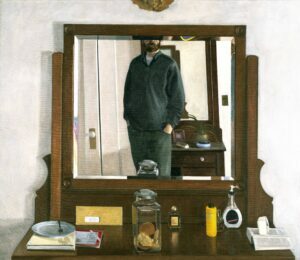 In doing so he turns what seem to be ordinary scenes of middle-class American life into paintings. 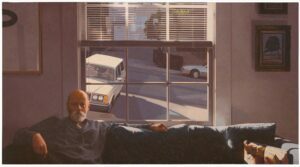 During his student years and into the 1960s, when he was getting his artistic footing, Pop art was evolving across the country and Bay Area Figurative art was flourishing locally. 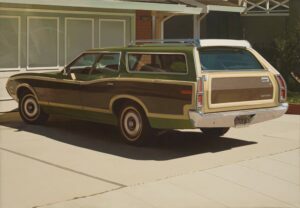 His resistance to getting caught up in the sensuous surfaces of figurative painting prompted him to move toward a tightly controlled paint handling and to work with photographic source material as a fundamental and explicit part of his practice, simultaneously exploring California culture and basic issues of painting in very matter-of-fact ways.